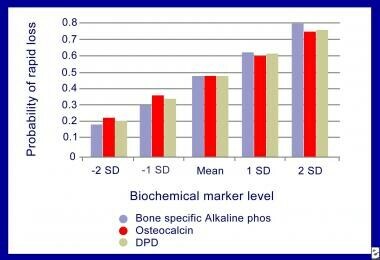 Prediction of bone loss with biochemical bone markers. Adapted from Ross PD, Knowlton W. Rapid bone loss is associated with increased levels of biochemical markers. (DPD stands for deoxypyridinoline.) J Bone Miner Res 1998 Feb; 13(2): 297-302. Such markers can also be useful in selected cases to improve the assessment of individual fracture risk when bone mineral density (BMD) measurement by itself does not provide a clear answer. The combined use of BMD measurement and bone markers is likely to improve the assessment of the risk of fractures in those cases. [2, 3, 4] See the Fracture Index WITH known Bone Mineral Density (BMD) calculator. Diagnosis of osteoporosis is not based on evaluation of bone markers, and bone mineral density (BMD) assessment is still the criterion standard for evaluation and diagnosis. However, mean values for markers of bone turnover are higher in osteoporosis patients than in the matched controls. In various studies, the mean urinary excretion of DPD is 20-100% higher in patients with osteoporosis than in healthy subjects. In another study, an inverse relationship between the quartile of urinary collagen type 1 cross-linked N-telopeptide (NTX) excretion and mean BMD exists, but these results are not consistent. Moreover, values of healthy subjects and patients with osteoporosis overlap substantially. Therefore, measurement of bone markers is not recommended to make a diagnosis of osteoporosis. For other discussions on osteoporosis, see the overview topics Osteoporosis and Pediatric Osteoporosis, as well as the articles Osteoporosis in Solid Organ Transplantation and Nonoperative Treatment of Osteoporotic Compression Fractures. Alkaline phosphatase has been clinically available for several years as a marker for bone metabolism. Serum alkaline phosphatase consists of several dimeric isoforms that originate from various tissues, such as liver, bone, intestine, spleen, kidney, and placenta. In adults with normal liver function, approximately 50% of the total alkaline phosphatase activity arises from the liver and 50% from the bone. The development of immunoassay-based markers with monoclonal antibodies directed to the bone-specific isoform of alkaline phosphatase has improved specificity and sensitivity. Changes in bone-specific alkaline phosphatase can lag by several weeks. Following the start of antiresorptive therapy, the suppression is observed with the resorption markers as the coupling process is normalized. The major advantages of using osteocalcin as a clinical index of bone turnover are its tissue specificity, its wide availability, and its relatively low within-person variation. In general, serum levels are elevated in patients with diseases characterized by a high bone turnover rate, and the serum levels reflect the expected changes in bone formation following surgical and therapeutic intervention. An exception is found in Paget disease, in which serum alkaline phosphatase is a better predictor of severity of disease than osteocalcin. Procollagen type 1 contains N- and C-terminal extensions, which are removed by specific proteases during conversion of procollagen to collagen. The extensions are the C- and N-terminal propeptides of procollagen type 1 (P1CP and P1NP). Anti-P1NP antibodies are used to detect the trimeric structure of P1NP by enzyme-linked immunosorbent assay (ELISA) or radioimmunoassay. Measurement of P1NP appears to be a more sensitive marker of bone formation rate in osteoporosis. These assays are being developed for clinical use. Until the early 1990s, urinary hydroxyproline was one of the main bone resorption markers available, but this assay lacked specificity and sensitivity. Hydroxyproline is a component of the bone collagen. During degradation of bone, it is released into the serum and reaches the urine in free and bound forms. Today, serum hydroxyproline is considered a nonspecific marker of bone turnover, since it is derived from the degradation of newly synthesized collagens, from collagens of tissues other than bone, and from diet. Therefore, more specific techniques have replaced urinary hydroxyproline. From a practical standpoint, another major drawback of urinary hydroxyproline was the necessity for dietary restrictions on gelatin intake before applying the test. Hydroxypyridinium cross-links collagen, PYD, and DPD. The pyridinium compounds, PYD and DPD, are formed during the extracellular maturation of fibrillar collagens and are released upon the degradation of mature collagens (see the images below). The measurement of PYD and DPD is not influenced by degradation of newly synthesized collagens and is independent of dietary sources. While PYD is found in cartilage, bone, ligaments, and vessels, DPD is found in bone and dentin only. The PYD-to-DPD ratio in urine is similar to the ratio of these 2 cross-links in bone, which suggests that both of the cross-links are derived predominantly from bone. PYD and DPD are present in urine as free moieties (40%) or peptide bound (60%). Free forms can be detected by direct immunoassays (free DPD, Pyrilinks-D). Deoxypyridinoline cross-linking in bone collagen. Rather than use the cross-links themselves as markers, several groups have developed assays based on specific antibodies raised against isolated collagen peptides containing cross-links. These fragments detected by radioimmunoassay technique are available for C-telopeptide of type 1 collagen (CTX, CrossLaps) and cross-linked N-terminal telopeptide of type 1 collagen by ELISA technique (NTX, Osteomark). The monoclonal antibody used for NTX assay is directed against the urinary pool of collagen cross-links derived from a patient with Paget disease. Only β-isomer of CTX is measured in serum CrossLaps assay, while α- and β-isomers of CTX are measured in urine CrossLaps assay. These assays have showed detectable reaction with urine from healthy individuals, as well as large increases associated with elevated turnover. 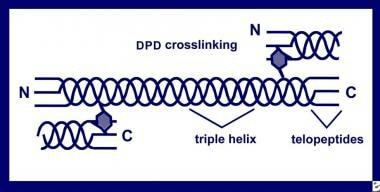 Currently, 2 categories of C-telopeptide methods exist: the CTX and type I collagen cross-linked C-telopeptide (ICTP). These recognize different segment domains of the C-terminal telopeptide region of the α1 chain of type 1 collagen and respond differently to bone metabolic processes. While CTX responds remarkably to antiresorptive therapies, serum ICTP is insensitive to normal metabolic bone processes, such as osteoporosis, but serum ICTP may be a marker of bone degradation in pathological conditions (eg, bone metastasis, rheumatoid arthritis). Urine creatinine varies during the day by 20%. 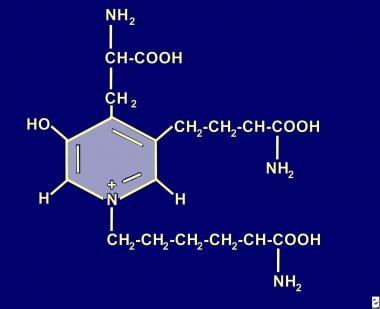 Urine cross-links/creatinine ratios vary by 20-30%. This variability could be corrected by measuring the markers in the morning (first or second void urine) when the levels are the highest. Serum CTX is the most commonly used measurement. Since it has been automated and there is a large amount of data available supporting the use of urine and serum CTX for following antiresorptive therapy. Relatively few noncollagenous proteins or glycoproteins have sufficient specificity for bone to be considered potential markers. Bone sialoproetin (BSP) is thought to be involved in the mineralization of newly deposited bone matrix and/or the calcification of extraskeletal tissues. BSP is a highly acidic protein with strong affinity for hydroxylapatite crystals. BSP may be a sensitive marker of bone turnover, and clinical data suggest that its serum levels predominantly reflect processes related to bone resorption. The discovery that the type 5b isotype is specific for bone osteoclasts has facilitated an antibody capture activity assay for tartrate-resistant acid phosphatase 5b as a bone resorption marker but is still under development. Bone mineral density (BMD) is an important predictor of fracture risk; however, a single measurement indicates only current BMD, not the anticipated rate of bone loss. Patients with a given BMD who are losing bone rapidly have a greater risk of fracture later in life. Nonetheless, patients with low BMD or high marker values would be at risk for osteoporosis and warrant preventive measures with antiresorptive agents. See the Fracture Index WITH known Bone Mineral Density (BMD) calculator. The relationship between biochemical markers of the bone turnover and the rate of bone loss has been investigated in prospective studies that show conflicting results because of the various technical limitations, such as precision error of the repeated measurements of bone markers and precision error of BMD measurements for rate of bone loss. Ross and Knowlton, in a study of osteoporotic fractures that monitored older postmenopausal women for 4 years, found that baseline markers of bone resorption were significant predictors of bone loss rate and found that the odds for rapid bone loss increased by 1.8-2.0 times for each standard deviation (SD) increase in the marker. They studied a subset of 200 women in a longitudinal component of the large Hawaii osteoporosis study (HOS), which included over 1100 postmenopausal women. They subdivided those women who had baseline markers into groups with rapid bone loss (>2.2%/y) and those with the slowest loss (< 0.4%/y). The average bone loss was twice as great for those women in the highest quartile compared with women in the lowest quartile. Similar data are available for younger postmenopausal women. Analysis of studies investigating whether baseline turnover markers can predict the bone density changes in patients treated with antiresorptive drugs has been controversial. In a subset analysis of a trial with alendronate, the baseline urinary collagen type 1 cross-linked N-telopeptide (NTX) or other parameters did not correlate with subsequent spine or hip BMD. The correlation was weak between baseline NTX and the change in spine BMD after 2 years of 2.5 mg of alendronate. Baseline markers of bone turnover provide insight into the state of the remodeling units in the adult skeleton. In younger and older postmenopausal women, resorption and the formation markers do predict, with some degree of confidence, the degree of bone loss without therapeutic intervention. However, the data published suggest that baseline turnover markers do not predict the response to therapy. With emergence of effective but rather expensive treatments, detecting those women at higher risk of fracture is essential. Several prospective studies have demonstrated a strong association between BMD and the risk of hip, spine, and forearm fractures. However, half of the patients with incident hip fractures have baseline BMD assessed by DXA above the diagnostic threshold of osteoporosis, defined as a T-score of -2.5 SD or more. Clearly, improvement is needed in the identification of patients at risk for fracture. In the large cohort of elderly women in France (EPIDOS), no significant relationship was found between levels of serum osteocalcin and bone alkaline phosphatase and the risk of hip fracture occurring during a 2-year follow-up. In contrast, 2 prospective studies in younger healthy postmenopausal women (OFELY and HOS) showed a significant positive association between an increased level of bone alkaline phosphatase and the risk of vertebral and nonvertebral fracture. Born resorption assessed urinary and serum C-telopeptide of type 1 collagen (CTX) or urinary free deoxypyridinoline (DPD) above the normal premenopausal range were consistently associated with about a 2-fold higher risk of hip, vertebral, and other fractures over follow-up periods ranging from 1.8-5 years. The combination of BMD and bone turnover measurement allows the identification of women at a much higher risk for hip fracture. The potential validity of this approach is illustrated in Table 1, below. The goal of treatment is to reduce the occurrence of fragility fractures, but their incidence is low, and the absence of events during the first years of therapy does not necessarily imply that treatment is effective. [18, 19] Bone mineral density (BMD) assessment with dual-energy x-ray absorptiometry (DEXA) is a surrogate marker of treatment efficacy that has been widely used in clinical trials. Given short-term precision error of 1-1.5% of BMD measurement at the spine and hip, the individual change must be greater than 3-5% to be significant. With potent bisphosphonates such as alendronate and risedronate, repeating BMD measurement 2 years after initiating therapy will show whether a patient is responding to therapy. Patients who are responding to therapy have a significant increase in BMD at least at the lumbar spine, which is the most responsive site. With treatments such as raloxifene or nasal calcitonin that induce much smaller increases in BMD, DEXA is not appropriate to monitor therapy. With any treatment, DEXA may not reveal all responders within the first year of therapy. This relatively low signal-to-noise ratio of this technique does not allow rapid (within months) differentiation of responders from nonresponders. Baseline bone turnover markers are weak predictors of the response to therapy with antiresorptive drugs; however, the change in bone markers is of greater value. Some women continue to lose bone while receiving antiresorptive therapy. This has been estimated to occur in approximately one third of women receiving estrogen and one sixth of those receiving bisphosphonates. Failure to respond may be due to noncompliance, poor intestinal absorption of drug, other factors contributing to bone loss, or other unidentified factors. Monitoring treatment of osteoporosis with bone markers may have the added advantage of improving compliance. In the Multiple Outcomes of Raloxifene Evaluation (MORE) trial, fracture risk with raloxifene therapy correlated better with changes in markers of bone turnover than with improvement in BMD. Further, in the Vertebral Efficacy with Risedronate Therapy (VERT) trial, subjects with a decrease in urine NTX of more than 40% and a decrease of urine CTX of more than 60% showed a greater reduction in fracture risk. On average a change of greater than 30% is significant. In case of an equivocal change in bone markers, a third measurement should be taken 3 months later. Eastell R, Bauman M, Hoyle NR, Wieczorek L, eds. Bone Markers: Biochemical and Clinical Perspectives. London: Martin Dunitz Ltd; 2001. Lewiecki EM, Baim S, Bilezikian JP, Eastell R, LeBoff MS, Miller PD. 2008 Santa Fe Bone Symposium: update on osteoporosis. J Clin Densitom. 2009 Apr-Jun. 12(2):135-57. [Medline]. Hadji P, Ziller M, Kieback DG, Menschik T, Kalder M, Kuck J, et al. The effect of exemestane or tamoxifen on markers of bone turnover: results of a German sub-study of the Tamoxifen Exemestane Adjuvant Multicentre (TEAM) trial. Breast. 2009 Jun. 18(3):159-64. [Medline]. Brown JP, Albert C, Nassar BA, Adachi JD, Cole D, Davison KS, et al. Bone turnover markers in the management of postmenopausal osteoporosis. Clin Biochem. 2009 Aprl. 42(10-11):929-42. [Medline]. Nielsen HK, Laurberg P, Brixen K, Mosekilde L. Relations between diurnal variations in serum osteocalcin, cortisol, parathyroid hormone, and ionized calcium in normal individuals. Acta Endocrinol (Copenh). 1991 Apr. 124(4):391-8. [Medline]. Gundberg CM, Markowitz ME, Mizruchi M, Rosen JF. Osteocalcin in human serum: a circadian rhythm. J Clin Endocrinol Metab. 1985 Apr. 60(4):736-9. [Medline]. Risteli J, Risteli L. Products of bone collagen metabolism. Seibel MJ, Robbins SP, Bilzekian JP, eds. Dynamics of Bone and Cartilage Metabolism: Principles and Clinical Applications. London: Academic Press; 1999. 275-287. Yavropoulou MP, Tomos K, Tsekmekidou X, et al. Response of biochemical markers of bone turnover to oral glucose load in diseases that affect bone metabolism. Eur J Endocrinol. 2011 Jun. 164(6):1035-41. [Medline]. Ross PD, Knowlton W. Rapid bone loss is associated with increased levels of biochemical markers. J Bone Miner Res. 1998 Feb. 13(2):297-302. [Medline]. Bone HG, Downs RW Jr, Tucci JR, Harris ST, Weinstein RS, Licata AA, et al. Dose-response relationships for alendronate treatment in osteoporotic elderly women. Alendronate Elderly Osteoporosis Study Centers. J Clin Endocrinol Metab. 1997 Jan. 82(1):265-74. [Medline]. Tsai JN, Burnett-Bowie SM, Lee H, Leder BZ. Relationship between bone turnover and density with teriparatide, denosumab or both in women in the DATA study. Bone. 2017 Feb. 95:20-25. [Medline]. Miazgowski T, Noworyta-Zietara M, Safranow K, Ziemak J, Widecka K. Serum adiponectin, bone mineral density and bone turnover markers in post-menopausal women with newly diagnosed Type 2 diabetes: a 12-month follow-up. Diabet Med. 2012 Jan. 29(1):62-9. [Medline]. Garnero P. Markers of bone turnover for the prediction of fracture risk. Osteoporos Int. 2000. 11 Suppl 6:S55-65. [Medline]. Roy DK, O'Neill TW, Finn JD, Lunt M, Silman AJ, Felsenberg D, et al. Determinants of incident vertebral fracture in men and women: results from the European Prospective Osteoporosis Study (EPOS). Osteoporos Int. Jan 2003. 14(1):19-26. [Medline]. Sarkar S, Reginster JY, Crans GG, Diez-Perez A, Pinette KV, Delmas PD. Relationship between changes in biochemical markers of bone turnover and BMD to predict vertebral fracture risk. J Bone Miner Res. 2004 Mar. 19(3):394-401. [Medline]. Garnero P, Hausherr E, Chapuy MC, Marcelli C, Grandjean H, Muller C, et al. Markers of bone resorption predict hip fracture in elderly women: the EPIDOS Prospective Study. J Bone Miner Res. 1996 Oct. 11(10):1531-8. [Medline]. Miller PD. Diagnosis and treatment of osteoporosis in chronic renal disease. Semin Nephrol. 2009 Mar. 29(2):144-55. [Medline]. Burch J, Rice S, Yang H, Neilson A, Stirk L, Francis R, et al. Systematic review of the use of bone turnover markers for monitoring the response to osteoporosis treatment: the secondary prevention of fractures, and primary prevention of fractures in high-risk groups. Health Technol Assess. 2014 Feb. 18(11):1-180. [Medline]. Cho IJ, Chung HY, Kim SW, Lee JW, Lee TW, Kim HS, et al. Efficacy of a Once-Monthly Pill Containing Ibandronate and Cholecalciferol on the Levels of 25-Hydroxyvitamin D and Bone Markers in Postmenopausal Women with Osteoporosis. Endocrinol Metab (Seoul). 2014 Dec 9. [Medline]. Baim S, Miller PD. Assessing the clinical utility of serum CTX in postmenopausal osteoporosis and its use in predicting risk of osteonecrosis of the jaw. J Bone Miner Res. 2009 Apr. 24(4):561-74. [Medline]. Ott SM, Bauer DC, Santora A. Ability of biochemical markers to predict 4 year changes in bone density in postmenopausal women. Bone. 1998. s159. Rosen CJ, Chesnut CH 3rd, Mallinak NJ. The predictive value of biochemical markers of bone turnover for bone mineral density in early postmenopausal women treated with hormone replacement or calcium supplementation. J Clin Endocrinol Metab. 1997 Jun. 82(6):1904-10. [Medline]. Clowes JA, Hannon RA, Yap TS, Hoyle NR, Blumsohn A, Eastell R. Effect of feeding on bone turnover markers and its impact on biological variability of measurements. Bone. 2002 Jun. 30(6):886-90. [Medline].